Is Corrections Corporation of America Going to Burn You? There's no foolproof way to know the future for Corrections Corporation of America (NYS: CXW) or any other company. However, certain clues may help you see potential stumbles before they happen -- and before your stock craters as a result. Why might an upstanding firm like Corrections Corporation of America do this? For the same reason any other company might: to make the numbers. Investors don't like revenue shortfalls, and employees don't like reporting them to their superiors. When that red line (AR growth) crosses above the green line (revenue growth), I know I need to consult the filings. Similarly, a spike in the blue bars indicates a trend worth worrying about. Corrections Corporation of America's latest average DSO stands at 51.8 days, and the end-of-quarter figure is 53.2 days. Differences in business models can generate variations in DSO, and business needs can require occasional fluctuations, but all things being equal, I like to see this figure stay steady. 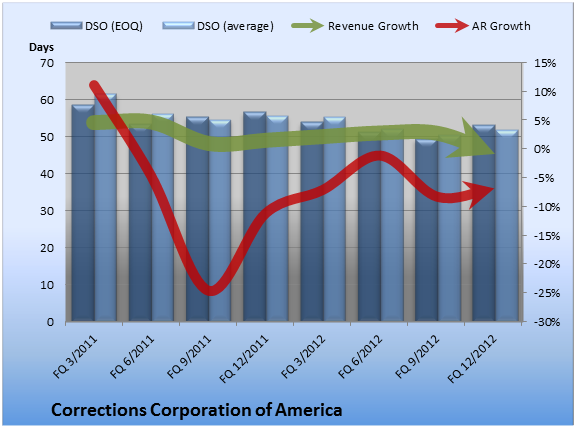 So, let's get back to our original question: Based on DSO and sales, does Corrections Corporation of America look like it might miss its numbers in the next quarter or two? The numbers don't paint a clear picture. For the last fully reported fiscal quarter, Corrections Corporation of America's year-over-year revenue shrank 0.6%, and its AR dropped 6.8%. That looks OK. End-of-quarter DSO decreased 6.2% from the prior-year quarter. It was up 7.6% versus the prior quarter. Still, I'm no fortuneteller, and these are just numbers. Investors putting their money on the line always need to dig into the filings for the root causes and draw their own conclusions. Looking for alternatives to Corrections Corporation of America? It takes more than great companies to build a fortune for the future. Learn the basic financial habits of millionaires next door and get focused stock ideas in our free report, "3 Stocks That Will Help You Retire Rich." Click here for instant access to this free report. Add Corrections Corporation of America to My Watchlist. The article Is Corrections Corporation of America Going to Burn You? originally appeared on Fool.com. Seth Jayson had no position in any company mentioned here at the time of publication. You can view his stock holdings here. He is co-advisor ofMotley Fool Hidden Gems, which provides new small-cap ideas every month, backed by a real-money portfolio. The Motley Fool recommends Corrections of America. Try any of our Foolish newsletter services free for 30 days. We Fools may not all hold the same opinions, but we all believe that considering a diverse range of insights makes us better investors. The Motley Fool has a disclosure policy.